Google quietly rolled out a significant local algorithm change in late July that has rocked local SEO. This update has been nicknamed, Pigeon, and there a number of things about it that are still a mystery. The SEO community is reporting considerable changes in local placements across the board, and the changes are still fluctuating. Let’s take a look at what we know about Google’s Pigeon update, how if may affect your local search engine rankings, and what you need to know going forward for your local SEO strategy. This new Google algorithm update has been labeled “Pigeon” by Search Engine Land because this is a “local search update and pigeons tend to fly back home.” Although the “core changes” are behind the scenes, the visible changes will be within the Google Maps search results and Google Web search results. Pigeon currently only affects local queries in English in the United States. What Types of Businesses Benefits from Local SEO? Basically anyone who serves clients at a physical business location with an address in a city and may be affected by Google’s Pigeon update. This includes social media marketers, web designers and other professions. What Changes has Google Pigeon Brought to Local Search? It appears that local rankings are being influenced by traditional search ranking signals including backlinks, domain authority and other ranking factors. Some experts in the SEO community are seeing a ranking boost to local directories including Yelp and TripAdvisor. When checking one client’s local listing post Google Pigeon, I actually observed what appears to be a correction. Yelp listings had been predominant in the search results in that particular local market. After Pigeon, the 7 Pack is appearing before the Yelp results. One suggestion as to why Pigeon appears to be favoring directory sites is that they are most likely authority sites. 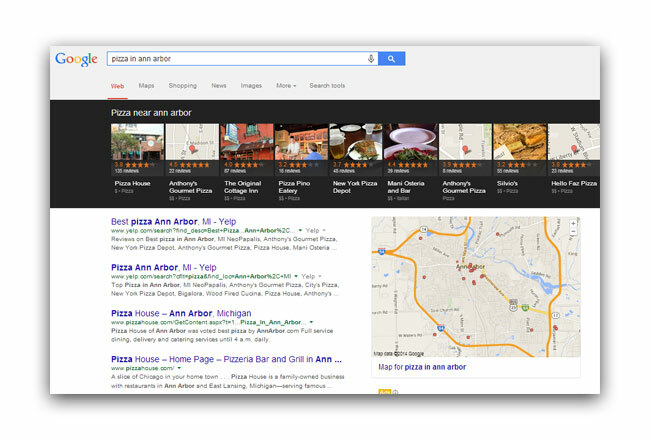 Google reviews appear to be giving weight to local search results. In one market that I observed, it actually appeared that the number of Google reviews influenced the ranking within the local pack. What we do know is that since Pigeon rolled out on July 24th, results have been changing daily. It will be a watch and wait game to see what ultimate changes Pigeon will bring for local search when the algorithm levels out. 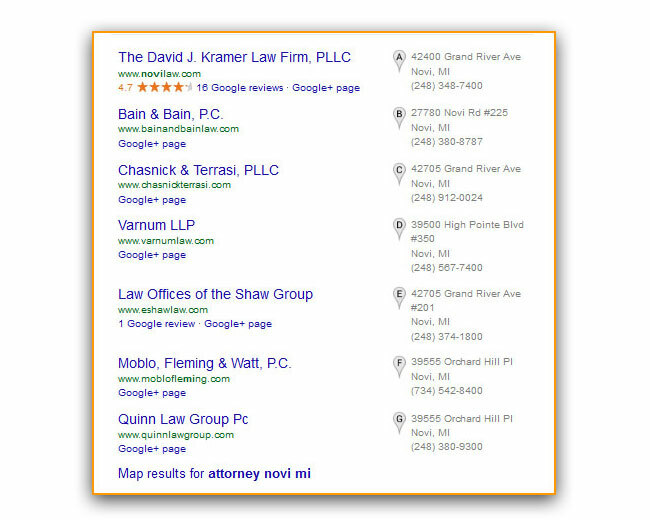 Google+ Local Page – If you don’t have a Google+ Local Page for your business, either claim the listing that Google may have set up for your business or have one set up. If you do have one, be sure that you have verified and have optimized it. Provide Value – Concentrate on creating unique and valuable content. Consistent NAP on Website – Be certain that your website is optimized for local search by including your company’s NAP (name, address and phone number) on each page. Consistent NAP on External Sites – Be sure that your website’s NAP is consistent across external website and directories including Yelp, CitySearch, etc. This includes your Google+ Local Page. If you own or work at a place, please don’t review your own business or employer. Don’t offer or accept money, products, or services to write reviews for a business or to write negative reviews about a competitor. 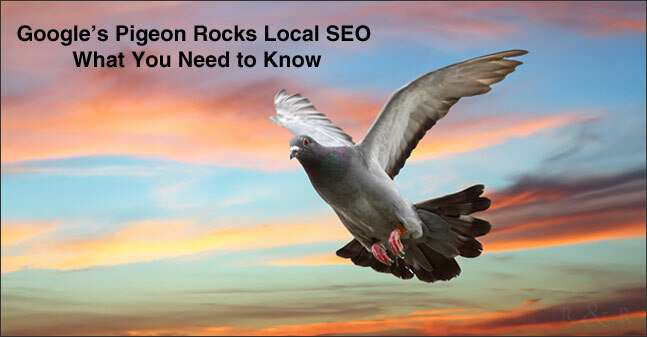 Google’s Pigeon local algorithm update has rocked local search engine rankings and the rocking is still rolling. There are some important observations that have been made since its debut of July 24th, 2014. As things are still shifting and changing on a daily basis, it is a “watch and wait” game. For now, following local SEO best practices is highly recommended. Your turn: Has your business been impacted by Google’s Pigeon update? Have you observed any significant changes to your website’s local search results since Pigeon rolled out? Fascinating information. I’ve been trying for years and years to figure out how to get our LOCAL flower shop listed near the top on google (not the 7 that pay for it). I’m using Alexa now, and yes the google things you suggest (but I’m not happy with the google+ business page and, quite frankly, I’m ignoring it right now). Norma set it up with a beautiful cover and I can’t find it, I can’t even figure out how to get to the page as a manager let along a real-person. I know I must work on google more and facebook less. Thanks. Tina, it is great to hear that you found this information about Google Pigeon fascinating. I was able to find your business Google+ page as it is linked to your website. Congratulations on having 37 reviews! Florists are a very competitive category and it will be interesting to see how things will play out once Pigeon as settled down. Question: are there two websites for your location? When I Googled florists and your zip code, a Roadrunner website came up in the results. Rocked Local SEO is right! Good summary of Pigeon. Looks like maybe more to come – according to Mike Blumenthal, they were experimenting with removing the Carousel some last week. It’ll be interesting to see where it ends up. Brent, thank you for stopping by and taking the time to read this. I did read Mike’s article on Google’s experiment with removing the Carousel. I agree with you. It will be interesting to see where this all ends up.